Joshua Boggs and his equally fleet-footed twin, Justin, have run races on every imaginable terrain since embracing the sport in high school. But their mad dashes to the finish — Joshua insists because he’s a few minutes younger he’s also the faster brother — have always had one thing in common: the course’s beginning, middle and end were above-ground. Oh, the Runnin’ Outta Our Mine 5K on Feb. 19 in Wampum, Lawrence County, finished in the sunshine. 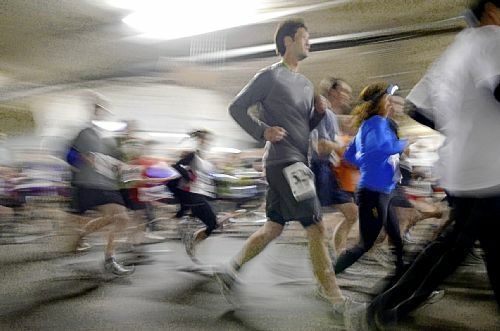 But for the rest of the 3.1-mile run, the 28-year-old Boggs brothers and 500-plus other runners found themselves where no one in running shoes and a race bib had ever gone before (at least in Pennsylvania) — underground. Staged in a retired limestone mine along Old Route 18, it was the state’s first underground race, and only the second in the U.S. Setting the standard is the annual Children’s TLC Groundhog 5/10K Run in Kansas City, Mo., which this year drew more than 3,500 runners from across the nation. It’s held in SubTropolis, a former limestone mine that in the 1970s and ’80s was repurposed into the world’s largest underground business complex. The natural environment of a mine provides controlled year-round temperature and humidity (it hovers around 55 degrees), so it’s not unusual for these vast subterranean spaces, after they’ve been abandoned, to be reused for the preservation of paper and film or vehicle storage. Bill Gates, for instance, keeps his vast Corbis photographic collection 300 feet underground at Iron Mountain Storage, a former limestone-mine-turned-storage-vault near Butler. Wampum’s Gateway Commerce Center — abandoned in 1946 — stores microfilm, computer tapes, film (including the “Star Wars” triology) and other records in secure vaults, along with hundreds of vehicles. Mines also have been used for agriculture — Creekside Mushrooms grows its famous Moonlight brand white button mushrooms 300 feet underground, in a former limestone mine in Worthington, Armstrong County — as well as recreational activities. Like hot-rodding in darkness and mud? Mines & Meadows ATV Riding Resort offers four-wheeled spelunking through an abandoned limestone mine less than a mile from Gateway Commerce. 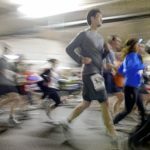 A race, though, is a whole different can of worms, mostly because the tiny computer chips that runners strap onto their shoe or ankle to register their time won’t work underground. Plus, where do you put all those people and how do you keep them from getting lost in the 2.5 million-square-foot mine? Veteran runner/race organizer Jim Pitts of Sharpsville, Mercer County, though, is a pretty creative guy. “We used a clock start, and had it end outside, so the chips didn’t matter until you finished,” he explains. As for observers, each had to sign into the cave and stand behind a yellow barrier tape. The idea for the underground race took off last October, after Mr. Pitts, 40, ran into old high school buddy Michael Wish, who owns Gateway’s archival and vital records entity Underground Archives, at the Monster Stomp 5K in New Castle. The men had bumped into each other at races over the years, but this time they actually got to talking. Mr. Wish had been mulling the idea of a race inside the mine to raise money for charity; after chatting with Mr. Pitts, warehouse manager for Kraynak’s in Hermitage, he realized he just might be able to pull it off. Soon they had a meeting with Mr. Pitts’ friend Herb Cratty, owner of Miles of Smiles Timing Services in Ellwood City, which provides electronic timing devices to hundreds of races a year. Before long, Gateway’s customer service rep Allison Frickanish helped draft a business plan, organizers had lined up more than 20 sponsors and Nikita Falen, a senior at Lincoln High School in Ellwood City, was tapped to sing the national anthem. Less than a month after opening up to entries in mid-December on smileymiles.com, with virtually no advertising, the race was sold out. “We had to turn hundreds of people away,” said Mr. Pitts, with calls coming from as far away as New York and North Carolina. Well, duh: “It was the opportunity of a lifetime,” said Ellwood City’s John Antinossi, 66, who’s been running for 26 years. Aside from timing, the biggest challenge was parking, requiring runners to be shuttled to the site on school buses. It also wasn’t the most lung-friendly race, thanks to the faintest hint of fumes from the hundreds of campers, RVs, boats and cars parked in “rooms” along the course, and a giant dust cloud kicked up by the Bobcat leading the way. Some also worried the cave’s uneven surface would make for a slower event (think “trail” instead of “track”). Pictures of the mine on Gateway’s website show a brightly lit, polished concrete roadway and white concrete block walls. Yet the course — carefully mapped out on paper before being marked with yellow police tape — pretty quickly turned into a dimly lit, and occasionally cramped, twisting maze of soft dirt and gravel. Aubrey Pursel of Hermitage had planned on running the 3.1 miles barefoot. But the gravel was “so bad,” he said, giving his soles a rueful glance, he only made it about 80 percent of the way without shoes. Not fast enough to win one of the trophies made from a hunk of limestone mounted on wood, the 37-year-old consoled himself with the obligatory slice of post-run pizza and Eat’n Park Smiley cookie. John Titus, 44, interim minister of First United Church of Christ in Harrison City, fared better, placing seventh in his age group with a time of 21:22:70. “The footing was a little challenging but it was relatively fast,” he said. (In case you were wondering, Joshua Boggs of Columbiana, Ohio, came in second overall with a time of 16:56:80, or .9 seconds ahead of his brother.) Winner Joshua Hayden of Pittsburgh, 29, clocked in at 16:26:10. Also on the plus side: none of the snow, whipping winds or frigid temperatures associated with a February run in Pittsburgh. Many runners, in fact, stripped down to T-shirt and shorts. And did we mention no hills? The race proved so successful, with about 530 finishers raising more than $9,000 for Family House, Venture Outdoors and New Beaver Borough Food Bank, that organizers already have penciled in a date for next year. Limited to 600 runners, it will be held on Feb. 18, with registration (hint: you better be quick) opening sometime in November. Check smileymiles.com for details. “Everyone did a good job, and people really had fun,” said Mr. Wish.